I contemplate my recent trip to the Islamic Republic of Iran and ask myself who wants war between America and Iran. I quickly surmise that it is not the American people, nor the Iranian people, but globalists (international bankers and their multinational beneficiaries). They control Israel, the American media and most of our politicians…and by extension our foreign policy. My journey to this exotic and little understood land began with an invitation to “New Horizon ~ The First International Independent Filmmakers Festival”. It was a conference and festival held in Tehran from September 2nd through September 7th. Filmmakers and intellectuals from around the world attended. It was one of the most stimulating experiences that I have ever had and an effective bridge between diverse cultures and perspectives ~ with the purpose of promoting truth, justice, liberty, and peace. This initiative was undertaken, not by America or other world leaders, but by a country unfairly besieged with sanctions and threats of war. My observations were in stark contrast to the perceptions of most Americans. What I experienced was a devout country with a love of God, family, and nation ~ and an uncompromising respect for the noblest of human endeavors. In the name of God who loves human beings. I, you, we and all of us are pursuing truth and happiness for human beings, which is unfortunately a victim of world powers. This is a historical opportunity to undermine all inhuman relations and put an end to prejudices, which have questioned the truths and separates them, to build a new beautiful world based on love, justice and beauty. This is a historical and certainly achievable objective. It only needs our hands, minds and hearts to join each other. I pray Great God to bless you, who love humanity and wish success for all. I hope to meet you in a better future. I found President Ahmadinejad to be a humble man with a firm handshake and intense, intelligent eyes. Despite his courteous and dignified bearing, he has been regularly berated, and routinely misrepresented, by a controlled western media. This is my attempt to represent truths, such that the world might have a better understanding of Iran, its people, and its leadership. The Iranian people are similar to Europeans in appearance…a beautiful people, poised and kind. Their women wear clothing which modestly cover them, but in elegant fashion and with serene faces that are usually exposed. They return smiles and are not treated as second class citizens, as we have been conditioned to believe. In fact, they outnumber men in higher education enrollments. There is no profanity and women are safe on any Tehran street ~ at any time of day or night. The influences of western civilization have not been totally removed, but the Iranians resist the decadence of cultural-Marxism. I attribute this largely to their faith and love of family. I was surprised to discover that the Islamic faith actually honors Jesus and Christianity. However, through Zionist media control, policy dictates, and other manipulations, the Christian world is incessantly convinced that Muslims should be our enemies and that we should be theirs. Muslims look with jaundiced eye upon the outrageous media lies and perpetual assaults on their faith and culture. Hollywood’s promotion of twisted films can provoke extremist reactions, and we are then led to believe that Muslims are all radicals. We never question the bizarre promotion of these divisive, Zionist inspired productions, or the actions of multinational interests in the internal affairs of sovereign Islamic nations. by these same Zionist and Cultural Marxist propagandists. They seek a globalist new world order ~ devoid of the diversity and freedoms associated with independent nation states. As I wandered from the festival grounds to meet people on the streets, I found them to be most helpful and without animosity ~ despite my obvious American nationality. I enjoyed their exotic food and came to appreciate the craftsmanship of their products. The only negative sensation that I had was in witnessing the mad house traffic situation in Tehran. A city of 15 million, it has grown faster that it’s infrastructure. Despite this, the city is thriving with new construction and beautiful parks and monuments ~ which reflect a noble and accomplished people. ED: Has no one yet told the Iranians they are supposed to be jealous of Western freedom? The current condemnation of Iran is supposedly due to the possibility that they may develop nuclear weapons. We should all work for a world free from nuclear threat, but the sovereignty of nations must also be respected. Iran is signatory to the Nuclear Non-Proliferation Treaty and has opened their facilities for inspection, declaring their interest is for energy development only. No evidence to the contrary has been shown. ~ as it is contrary to their nation’s faith. However, Israel, their chief accuser (and architect behind the campaign to falsely accuse Iraq of possessing “weapons of mass destruction”), is believed to possess over 300 nuclear weapons. Israel is not signatory to the Nuclear Non-Proliferation Treaty and has no intention of sharing information or opening their facilities for inspection ~ yet America continues to march to their fanatical war drums against others. Why is there no pressure on Israel to meet the same standards and why are we imposing “sanctions” against a nation that has done us no wrong? It is a preliminary act of war, and only imposed because Israeli lobbies demand it of our lap-dog politicians, who incredibly serve Zionist interests rather than the American people. Iran is a strategic rival for regional hegemony in the resource rich middle-east and has stood strong for Islamic unity. They also courageously and most justifiably call for an end to the Palestinian occupation ~ the ruthless suppression of an enslaved people, largely funded by America. There is no greater injustice than that being perpetrated against the Palestinian people. World condemnation, through the United Nations is consistently blocked by U.S. actions on the Security Council. As a result, the Non Aligned Nations Movement (NAM) is growing as an alternative to the UN. Its recent success is not generally reported in Western media, but 120 nations came together in Tehran the week before the New Horizon Film Festival ~ in unity and in opposition to the evils of the Israeli occupation of Palestine. The Secretary General of the United Nations even attended, as well as observers from Russia and China. The Palestinian occupation and Israeli aggressions (including “false flag” operations against other nations) are at the root of the discontents for Zionism. 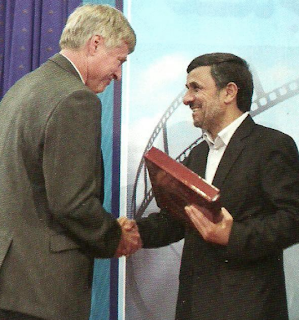 As President Ahmadinejad gave me copy of Khayyam’s works, I gave him copy of my western motion picture, “Jericho”, and my political book, “Our Vision for America”. When I asked him what messages I might convey to the American people, he indicated “truths” and “Iran’s desire for peace”. Through lies and evil acts, Globalists and Zionists falsely portray Iran, as they seek conflict between nations. I later told him that our State Department should be meeting with Iran’s leaders and not depending on the initiatives of private citizens, like me. However, I hope that he and the Iranian people take hope in the prospect that many patriotic Americans are awakening to the evils that have consumed us, even while our politicians continue to betray the otherwise good spirit and traditions of the American people. Growing numbers seek answers that might save America and truly promote world peace. Americans do not want war, and are beginning to realize that our politicians, of both major parties, initiate these actions against the wishes of the American people ~ and in accord with the intrigues of international bankers and their Zionist agents. It is time we stopped them by creating alternatives in politics, and in media. Iran sees the need and is taking appropriate initiatives, and so should America. I went to Iran to promote the prospects for producing “False Flag”, a critically important motion picture. I returned to America more committed than ever to produce this political thriller and, through commercial entertainment, help awaken a sleeping America. Vital truths must be revealed so that new evils are not perpetrated against the people of America and Iran, with destructive effects resonating throughout the world. I also hope to meet you in a better future”. Here is to "better futures"! IS HILLARY SEEKING A GRACEFUL EXIT? ARE THE SAUDIS BANKROLLING ISRAEL’S MOSSAD? ARTHUR TOPHAM: IS CANADA A DEFACTO POLICE STATE? URGENT SOS TO ALL CANADIANS!!! VIDEO: THE TRUTH REVEALED: GLOBAL ALERT ON GMOS.